PocketMoney Coupons is expanding nationally and looking for investors. 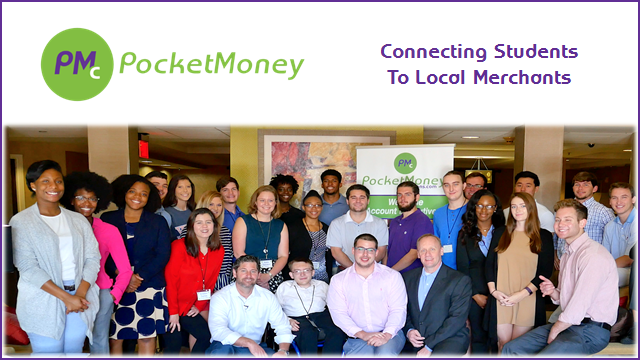 PocketMoney is a fast-growing college marketing company started in 2015, by experienced marketing professionals in Atlanta, Georgia, as an idea to bridge the gap between college students on a budget and the local businesses in college towns that rely on the student's discretionary spending. PocketMoney is an industry leader in marketing the local businesses to the college demographic! PocketMoney Coupons is expanding nationally and looking for investors! PocketMoney is a fast-growing college marketing company started in 2015, by experienced marketing professionals in Atlanta, Georgia, as an idea to bridge the gap between college students on a budget and the local businesses in college towns that rely on the student's discretionary spending. Their mission is simple: help college students save money while helping the local businesses grow. PM's print coupon book and free mobile app are both filled with any-time deals to the best local restaurants, shops, entertainment, and more. These products allow students to live large in their college towns by using discounts on all their transactions which can result in students saving thousands of dollars a year. PocketMoney does more than just help students stretch their wallets at local restaurants and shops in their college town. They offer students opportunities to acquire real world experience and build their resumes through our hands-on internship programs. In all of their programs, students are empowered to jump outside of their comfort zone and use their creativity while they gain valuable skills that will help them be successful in the future. Students play a major role in the PM products! Since they’re representative of the student body, they know which businesses and types of deals students will be excited to see in our products. After the in-person training conferences, students build the products during the summer by connecting with local merchants. PM's Brand Ambassadors give class presentations and promote at events year round to grow the app user base. PM develops students from start to finish and doesn't stop there! They're partnered with over fifty Fortune 500 Companies that actively recruit their interns. PM has helped hundreds of students launch their careers at companies like ADP, AT&T, Hershey’s and more. PM launched back in 2015 at eleven colleges and the response was nothing short of extraordinary. Today, PM is operating in twenty four college towns and is ready to go to market across the country leveraging a nationwide market of over 3,600 colleges. PM has just expanded it's digital platform to include Website Design, SEO, SEM, Custom Videos, Reputation Monitoring, and Social Media Campaigns! PM is poised to expand to every college town in America! To learn more go to http://www.pocketmoneycoupons.com and download the free app today! Atlanta Sales Training Conference 2017PocketMoney does more than just help students stretch their wallets at local restaurants and shops in their college town. They offer students opportunities to acquire real world experience and build their resumes through their hands-on internship program.